If you enjoy travelling in time, I’m sure you will appreciate the birth place of the infamous Campari, as much as I do. 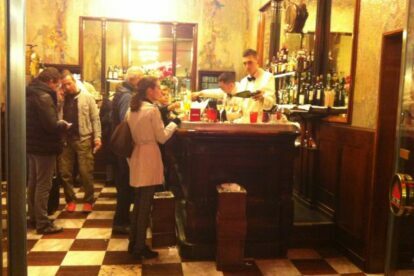 The original founder of the Camporino Bar, Davide Campari, was actually born in the Vittorio Emanuele Gallery! This is my all-time favorite pit stop next to the Duomo for a quick drink. Every time you grab a drink there, it feels like you are stepping into old Milan. You thought the only true Italian aperitif drink, is Aperol Spritz? Learn your lesson here and come out as a true insider: Negroni, Sbagliato, Americano…find your preferred version among all of these Italian favorites in a beautiful 1920s art deco setting. The best part about it: if you order directly at the bar inside (instead of getting ripped off by sitting down on one of their Galleria tables), the very fair price starting at € 5 per drink (including snack buffet) allows you to try them all. Despite its location, you will still rub shoulders with many locals popping in for a quick drink. In my eyes, Camporino is a true insider in the least expected location. My top tip: try the Campari Spritz instead of the Aperol Spritz, it’s a bit less sweet and a lot cooler!